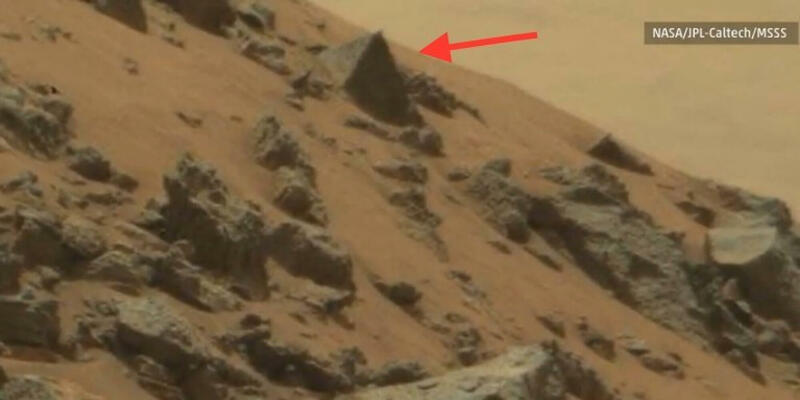 NASA’s Curiosity rover has photographed a pyramid on Mars–at least that’s what some paranormal enthusiasts seem to think. Not surprisingly, NASA’s explanation for the object in the photo is somewhat simpler. Photo snapped by NASA’s Curiosity rover on May 7, 2015 purports to show a car-sized pyramid on Mars. Curiosity was launched into space on Nov. 26, 2011 and landed on Mars on Aug. 6, 2012. As for the size of the rock, Bell said an analysis by the Mastcam team suggests that it’s only about four inches tall, or the height of an 8-ounce soda can. Bell, who termed the photo “fun to look at…but not particularly Earth-shattering,” seems to have been trying hard not to offend anyone who believed the pyramid story. Ouch. And this isn’t the first time claims about strange objects on Mars have been shot down. In recent months people have spotted everything from a skull and a thighbone to an iguana. As for little green men, no sightings reported–yet.